Despite skyrocketing pending sales, Atlanta home buyers continue to struggle finding available properties to buy. There’s no shortage of properties under contract, but it’s obvious that many of these pending sales are failing to close. Demand from buyers appears to have increased, but the availability of homes for sale has not. This imbalance has kept home prices on the rise, shrinking the affordability factor for many of today’s buyers. Pressure from investors and the declining inventory of REO/distressed properties has left a void in the entry-level price range. Properties are going under contract quicker than they have in years, yet the days to closing is only down slightly. Speaking with my lender partners, it’s apparent that the current volume of real estate transactions has exceeded the capacity of many mortgage processing and underwriting departments. In addition to financing hurdles, multiple offer situations are still putting undue pressure on today’s buyers. As it has the past couple months, the number of homes sold in Atlanta remains considerably lower than last year’s numbers. At 6,109 sold listings, home sales in May 2016 were 17.7% lower than they were last year, even though they were up 17.3% compared to a month prior. Despite the red hot market and under contract signs everywhere, sales volume still does not reflect the flurry of activity. It’s hard to pinpoint the reason for lagging sales. The number of pending sales should be a good indicator, but that wasn't the case the past few months. Based on personal experience, I think the massive influx of pending contracts has overwhelmed lenders and underwriting departments, causing many transactions to get hung up. Also, a disconnect remains between sellers’ expectations and buyers’ ability to perform, which is only magnified by the pressure of multiple offer situations. As I mentioned before, the number of pending sales has skyrocketed this year. In April, pending sales were up 57.7% YOY, and in May, up 55.1% YOY. The number of pending sales remained nearly unchanged from April to May, with nearly 16,700 properties under contract. To put things into perspective, two years ago (May of 2014), there were only 8,834 pending sales. Just looking at the chart below, you can see how the number of pending sales has exploded in recent months. New pending sales have been up as well, contributing to the total number of properties under contract. In fact, there were 9,395 new pending contracts in May, representing a 23.2% increase from a year prior. Pending sales typically start to drop off this time of year, but only time will tell if all these contracts actually close. It wasn’t long ago that you could actually find homes under $100,000, even in “good areas”. I was recently looking for something inexpensive for a client and was amazed by how little there was to choose from. Sure, prices have generally gone up across the board, but finding a decent property under $100K is a challenge to say the least. I guess the influx of hungry investors and the lack of distressed properties has caused them to dry up. Looking back to the second quarter of 2011, you can see how they’ve sharply declined. In May, the number of properties priced $50K - $75K was down 28.4% from a year earlier, while those priced $75K - $100K were down 29.1%. I think it’s interesting to note that, the number of active listings in all price ranges was down 10.9% YOY to 25,491, and compared to five years ago, there’s only about half the number of active listings on the market. Active inventory is low, but even more so in the lower price ranges, making things even more difficult for entry-level buyers. If you’re in the market to buy, you know, homes that are priced right and property prepared to sell, go under contract in a matter of days. As it did last month, the median days to contract dropped once again, reaching a mere 19 days in May. This means homes went under contract a full week sooner than they did the same time last year. After peaking in February, the median days to contract has been down about 26% the past few months, while the average days to contract was down about 14%. If history repeats itself, we may see the median days to contract drop even more in June. At this point, I don’t know how it can go much lower! 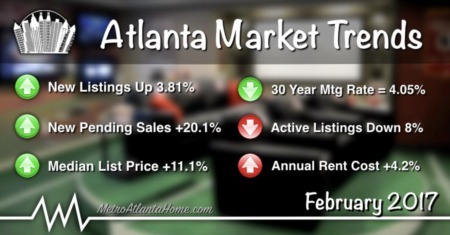 The current seller’s market continues to push home prices in Metro Atlanta higher. The average sale price in the metro area increased to $277,376, up 3.8% from the same time last year. The median price was also higher coming in at $224,900, a 6.1% year over year change. Price appreciation has been modest over the past few years, yet, seemed to pull back slightly in May. As you can see in the chart above, home prices are hitting their summer highs. We can expect that prices will continue to rise in June, and possibly into July and August. It was interesting to note that, single family home prices were up an average of 3.9% YOY, while Townhomes sold for 6.8% more, and condo prices were actually down 3% from a year earlier. Mortgage rates have continued their decline, dropping again this month. Thanks to Brexit, the 10-year U.S. Treasury yields dropped sharply after the vote, bringing interest rates down with it. Many industry experts predict mortgage rates will continue to drop and may hit all time lows. The current climate is very attractive to anyone looking to purchase real estate, or refinance their current home. Days on market (DOM) for Brookhaven real estate has plummeted with the onset of the summer market. Median days to contract in May was 10, while average days to contract was 21 (down 43.2%)! However, closed sales were down 38.3%, at a mere 79 transactions. There were 269 active listings, representing a 3.1% increase from a year earlier. New listings were down 8.1% year over year, and new pending sales were up 4.1% YOY. The average sale price increased to $489,784, a 4.7% increase over May 2015. 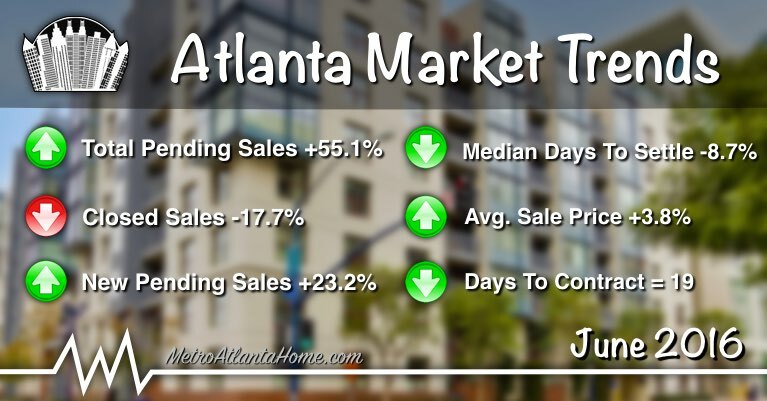 Even one of the hottest areas is Atlanta is not immune to slumping home sales. Closed transactions in Buckhead were down 24.7% for the month, with only 58 closed sales. Active listings were actually up 6.7% from the same time last year, with 317 properties on the market. This, despite the number of new listings dropping 8.3% year over year. There were 79 new pending sales in May, the exact same number there was last year at this time. The average list price per sq/ft for new listings was $287, while the average list price per sq/ft for new pending sales was $268, a 4.4% increase and a 2.5% decrease respectively. The lack of properties for sale in the city of Decatur continues to get worse. There were only 99 active listings last month, which was down from 140 in May of 2015. This shortage of available properties has likely contributed to the number of closed sales dropping 37.3% YOY, also pushing the average sale price up 16% to $451,954 in the first quarter of 2016. A shortage of new listings (down 12.2%) has prevented the available inventory from growing, yet pending sales were only down 2.9% year over year. The list price per sq/ft of new properties has skyrocketed this year, increasing 36.1% YOY in the first quarter of 2016. It appears home buyers were hungry for properties in Duluth. May’s new pending home sales jumped 41.2% YOY to 192 properties under contract. The number of new listings was up 9.9% compared to last year, help the active inventory of homes for sale to edge up 2.8% YOY. Closed transactions were still down 19.3% YOY despite the massive jump in pending sales the past few months. Average sale prices have continued to see consistent YOY increases, with the average price hitting $341,718 in the first quarter of 2016. The median days to contract has plummeted 28.6%, now at only 10 days to contract for properties that sold. The active inventory of homes for sale in Dunwoody has had trouble growing, ending the month down 18.8%. A major contributing factor was the lack of new listings. There were only 57 new properties hitting the market, this is 36% less than there was last year at this time. As seen in other areas of Metro Atlanta, closed transactions in Dunwoody were down 26.8% to just 41. Home prices have continued to appreciate. In Q1, the average price surpassed $400K for the first time in years. The average list price per sq/ft was up 4.4% YOY in the first quarter of 2016, yet the median sale price to original list price ratio was down 0.8%. Norcross sellers have upped their asking price, according to the average list price per sq/ft of new listings and new pending listings. The average for new listings increased to $107 (+8.1%) and the average for new pending listings rose to $102 (+8.5%). Active inventory for the month was limited, down 38% compared to a year prior. New pending sales were up 6.8%, but closed sales for the month were down 39.6%. Home prices in the first quarter of 2016 remained fairly stable at $205,616, a 2.6% YOY increase. In the first quarter of 2016, the average sale price of homes in Roswell increased 14.1% YOY, up to $374,281. We’ve also seen the average sale price per square foot consistently increasing, now reaching $135, a 6.3% improvement from last year. There were 153 closed sales in May, up from 122 a month earlier, but down from 193 a year ago. Active listings remain down 17.1% YOY, while new listings were own down 2.1% over the same period. New pending sales remained relatively constant, only dropping 0.5% compared to May 2015. Since December of 2015, the inventory of homes for sale in Tucker has remained historically low. Down 44.4% compared to May 2015, the active inventory has yet to see any growth this year, likely fueled by the 33% decline in new listings. New pending sales were actually down 3.3% in May, which has also helped contribute to a 28.3% drop in closed transactions. The average sale price continues to trend upward, increasing 8.9% YOY to just over $194K in the first quarter of 2016. 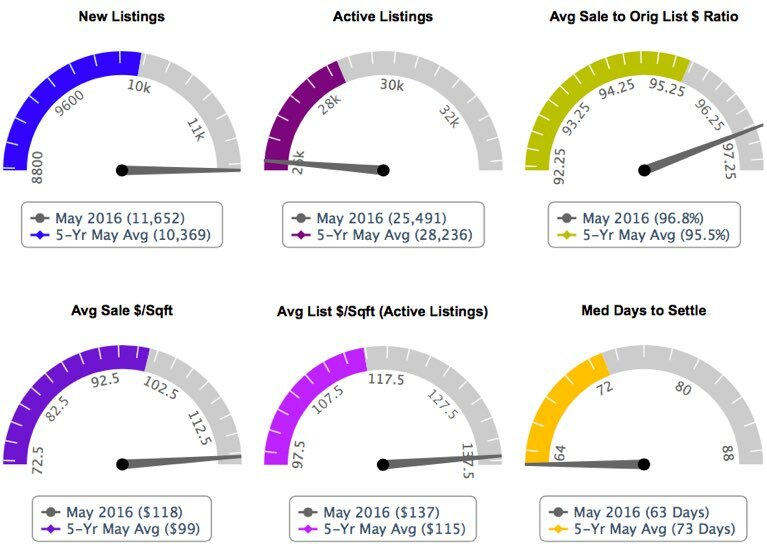 *Market statistics are based on FMLS listing data provided by CoreLogic through May 2016.